To make your journey as seamless as possible, we have noted some frequently asked questions below which you may find useful. What airline do you use for the pre and post cruise packages in Myanmar? We use Air Bagan for all our pre and post cruise flight arrangements in Myanmar. Please view www.airbagan.com for more information. Further flight information can be found here. I am interested in booking a Pandaw cruise and would like to check rates and availability, how can I do this? You can easily check dates, availability and prices on our website. If you click on the Expeditions link in the top menu bar it will bring up all the different cruises we offer. Click on the one that interests you and look at all the various details. If you click on 'Click here to choose your dates and Book Online' it will show you our current availability and price of a twin main deck cabin. If you then click on the date of your choice you are then taken another screen where you will see the deck plan. The cabins taken are indicated by the figures of people lying in them whilst the free cabins are empty. Hopefully this will make sense when you see the plans! Full pricing is shown next to the deck plan. I have tried to pay my final balance online on numerous occasions and each time it is declined. Can you help? Have you entered your name exactly as it is on the card? Used the same billing address as you use for your credit card? Put in all 16 digits of the card number with no spaces in between? Entered the 3 digits from the back of your card where it asks for CVV number? Answered successfully any addition security questions you where asked? However, if you have done all of the above it is possible that your bank has put a block on the payment, perhaps because our company is registered in Singapore. Most of our clients have found that if they call the bank and authorise the payment, they can process the booking with no further problems. I am booked to take a Mekong cruise soon and I am organising my visas. Can you please tell me the points where the ship crosses the border in both Vietnam and Cambodia? The ship crosses the border at Vinh Xuong in Vietnam and Kaam Samnor in Cambodia. How large are the beds in each cabin? The mattress dimensions of our cabin beds are: (90 x 199 x 22) cm. What will I be charged for onboard? Local mineral water, jugged coffee, teas & tisanes are all complimentary. All other drinks will be charged. I have just paid the final balance for my cruise and cannot print my ticket, why is this? Pandaw cannot issue your tickets until all the passenger details have been filled in. It may be the case of your booking that you have not entered all the necessary information into your booking. Once all this information has been received, you will be able to download your ticket online. How do I pay my final balance online? I am interest in taking my family onboard a Pandaw cruise. Would this type of cruise be suitable for children? We certainly welcome children on board our ships that generally enjoy the cruises greatly. Please visit our Family Friendly Cruises page for the latest information and offers on children. Is it possible to book a triple cabin? It is not possible to book a triple. All our cabins are twin. We do allow infants below the age of 4 years may sleep in their parent’s cabin on a mattress placed on the cabin floor between the two beds. I am interested in doing a Pandaw cruise but would like to know which is the best cabin to book? The layout of all cabins on the ship are the same, it is just the location that is different. Some people tend to prefer the right hand side of the ship as it is closer to the sundeck and further away from the anchor but it really is your own personal preferences, which cabin you choose. The main advantage of cabins on the upper decks and main decks is that you have windows and space outside your cabin to sit and look out on to the river. In the lower deck there are no windows, just port holes and have no space outside the cabin to relax. As we cruise downstream or upstream there is lots to be seen on both sides of the river and many of our stops along the river can be on either side of the river too so all cabins offer similar views. Do all the cabins have twin beds? Do you have double beds cabin? Yes, our beds can be pushed together to form doubles. 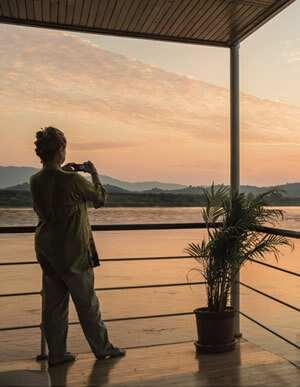 I read that I can obtain the Cambodian Visa onboard the upstream Mekong cruise, is this true? Passengers can obtain the Cambodian visa upon arrival at the border between Vietnam and Cambodia on the Mekong River at a cost, paid in cash in US$, per person. You will need to bring a passport size photos on board with you in order to arrange this. Is there internet and wifi on board? Internet is available on all the ships. We have a computer in the shop on the sun deck which passengers can use to access the internet. As we are sailing rivers, the connection is not always reliable and it can be quite slow also. We have Wifi on all the ships on the Mekong. Passengers can access the wifi only when we are in Phnom Penh port and it can be accessed from the Saloon and some parts of the sundeck. The crew can advise the best place to get connection and the name of the connection. Mobile phones work on all rivers we ply in most places, except Myanmar, where there is a local mobile network that is connected to the international roaming networks. All of our cabins are air-conditioned, as are the dining rooms and lower deck areas. The saloon bar is air-conditioned on all ships except the Orient Pandaw and Indochina Pandaw, which have open saloon bars so are cooled by fans instead. On the river cruise is it necessary to take malaria tablets? The water around the river is fast flowing and Malaria is usually found around stagnant water. Therefore, there is not a high risk of maleria in this area. As a ship owner/operator, we are not allowed to offer any medical advice so we suggest that you to contact your doctor for advise on whether you should take any precautions or vaccinations in this area as each person will have different medical histories and requirements. But we do not sailing to any Malaria infected area and normal precautions as to using a repellent in early evening and before sunrise should avoid any mosquito concerns plus cabins are air-conditioning. What should I bring when I visit the schools? Sports items: basket balls, soccer balls, badminton sets are always great for the children to stay fit and play together. Educational items: writing pads, pencils, pens are always necessities for facilitating learning. English learning DVD’s with Cambodian instructions, kindergarden and primary school English books are useful. Personal Care: shampoo, soaps, laundry detergent, toothpaste, tooth brushes, band aids, mosquito nets are always in need. Please contact us if you wish to cancel your booking.